Yay for new stuff! This week I have added over 300 lovely new items to StormJewel’s Gifts, mainly from the fabulous Alchemy Gothic and the ever popular Nemesis Now. In case you haven’t seen their stuff before, they work with artists from the UK to create gorgeously gothic figurines and jewellery, and allow you to indulge your fantasy side with all different kind of fairy figurines and gifts (butterfly and bat winged fairies, cute ones, gothic ones) which you can decorate your home, garden or altar with. 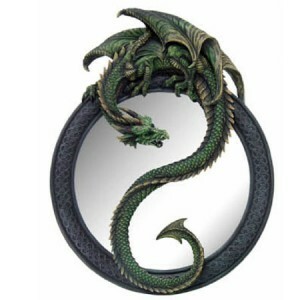 Dragon Mirror by Nemesis Now! 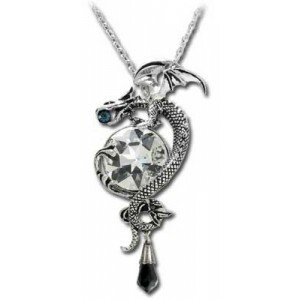 For the dragon fans among you (and you may know that I am obsessed with these majestic creatures) there’s gorgeous dragon figurines, and lots of unusual gifts from dragon boxes to wine holders, wall plaques and artwork by Anne Stokes. As well as fantasy artwork (in the form of scrolls to hang on your walls), the talented Anne Stokes brings us her gothic collection of figurines, including wonderfully vampy ladies, gorgeous trinket boxes and more, do take a look! I’ve also added a new line of Gothic and rock clothes, such as Gothic and Pagan Dark Star Clothes and Vince ray t shirts for girls and boys. There are so many new products that I know Magick enthusiasts will love so come visit my shop!